Procession to commemorate the first Mass in Chile. Credit: Diocese of Punta Arenas. 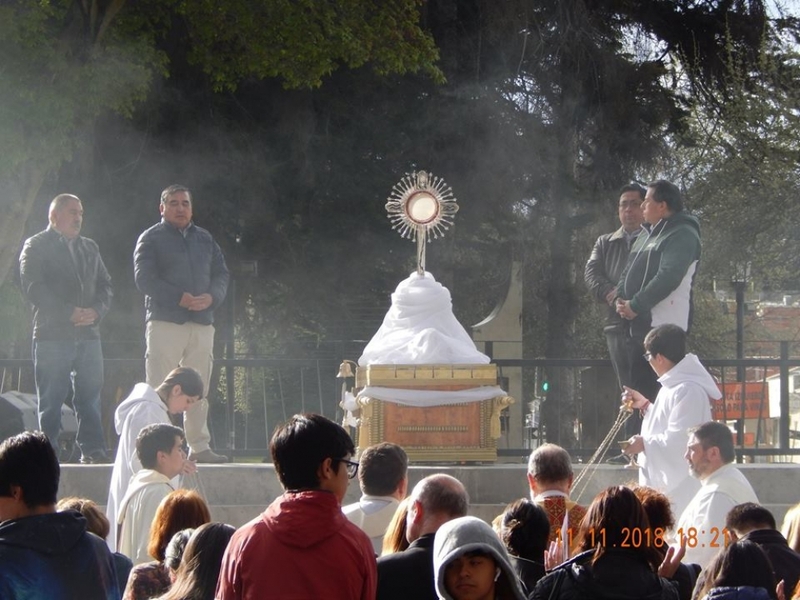 Punta Arenas, Chile, Nov 15, 2018 / 10:56 am ().- A Eucharistic procession through the Patagonian city of Punta Arenas launched the 500th anniversary commemorations of the first Mass celebrated in Chile. Friar Pedro de Valderrama, the chaplain for the expedition of the Portuguese explorer Ferdinand Magellan, offered Mass on Sunday, Nov. 11, 1520 in Fortescue Bay on the shores of the Strait of Magellan. This Holy Mass at the extreme southern tip of Chile became the first Eucharist celebrated in the South American country. On Nov. 11, the faithful from different communities gathered at the Human Rights Plaza in downtown Punta Arenas, the capital of the Magallanes Region, for a period of prayer before the Blessed Sacrament to help launch this major celebration, which will close on Nov. 11, 2020. Bishop Bernardo Bastres of Punta Arenas, led the prayers and a Eucharistic procession to the Punta Arenas cathedral. “Processing down the main street of our city, we gather in our common home, which welcomes us with love, warmth and hope,” he said. Credit: Diocese of Punta Arenas.